Back in November, we shared with you the Neptune Pine Android smartwatch project on Kickstarter, showing the new design of the gadget. The gadget reached its goal of $100,000 on Kickstarter, and managed to grab a whopping $800,000+ funding to bring the device to market. Recently, the folks behind the Neptune Pine smartwatch showcased the gadget at the Consumers Electronics Show going on in Las Vegas, and began taking pre-orders for the device for a hefty $335. No doubt it’s something that cannot be classed as a watch due to its big size, but considering that it gained way more than it asked for on the Kickstarter project, there could be demand for it. 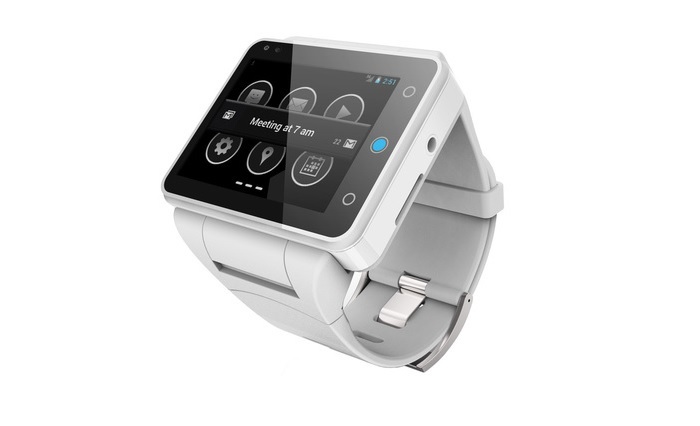 Basically, it’s not just a smartwatch, but a smaller smartphone resting on your wrist. Other wearable need to connect to your smartphones to brings you all the notifications, but this one is a standalone Android smartwatch that can do almost everything your smartphone can. It comes with a huge 2.4-inch display sporting a resolution of 320 x 240 pixels and is powered by a dual-core Snapdragon S4 processor with a clock speed of 1.2GHz and 512MB of RAM. It offers users with 16/32GB of storage and in comes in two colors: Polar White and Jet Black. The smartwatch runs Android 4.1 Jelly Bean out of the box, and comes with a full QWERTY keyboard for all your typing needs, thanks to its big size. On the connectivity side, it comes with a micro-SIM card slot and supports major GSM and CDMA networks, allowing you to make full use of it. Other connectivity features include WiFi, Bluetooth 4.0, GPS, USB 2.0 and NFC (only 8GB model). The smartwatch comes with a 810 mAh battery offering the watch enough juice to carry out all its functions. Well, the smartwatch is up for pre-orders, and if you don’t mind its big size, you can grab the 16GB model for $335 and the 32GB model for $395.